I do not like having my apps on my phone change over night without me clicking so much as an OK button. This morning, I open my phone to search the market – and there it is – “Sprint” – right where my downloads tab was. I’m not ok with this. When I update an app on my phone, I’m prompted with information about what the app has access to and the ability to say, “hmmmm…. I don’t think I want that”…. I might be able to accept that fact that I don’t have the ability to turn down an update to the phone that will close a security issue, or fix a critical bug – but changing my market app without so much as an text message isn’t giving me warm fuzzies. I get how they did it – the market is similar to a website – the content changes each time I open it – and I understand why they did it – they want to market their apps… I want my downloads tab back on the home page of the market. The HTC EVO is SOLD OUT EVERYWHERE!!! Does this mean this phone is the BEST phone out? No – it means HTC isn’t keeping up with demand. Could the HTC EVO out sell the iPhone? We will never know because if its unavailable, people don’t wait weeks and months to find one – they get something else. You could say that’s not the case with the iPhone because if you want the iPhone 4 – there isn’t any other option. You will wait. But with the Droid X, the HTC HD2 (now with an Android 2.1 with HTC Sense ROM available), the Dell Streak, the orginal Droid, the Droid Incredible, etc, etc, etc – Can you really expect people eligible for an upgrade (read able to jump mobile providers) to wait for you to get it together? Of course not. I get that scarcity can create demand but total unavailability boosts the sales of your competition. Com’on HTC and Sprint – get it together! The title says it all – check out the mIQ app from BestBuy – its on the market and its free. What does it do? Have you heard of carbonite or mozy? Automated, real time backups for your phones pictures, videos, text messages, calendar, and contacts. Pictures – flawless backups – it just works. Video – works great – as long as your videos are less than say 10 seconds or so. This is because of the 20 meg size limit on videos. This issue is a big one for me – I’ve contacted the app support team and submitted several feature requests – this is at the top of the list. Last but not least of the short comings – it only allows for 1 gig of space! Yes, I know, your phone has an 8, 16, or maybe even a 32 gig memory card – 1 gig isn’t going to cut it. 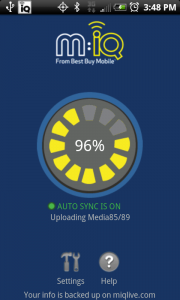 Currently this no option for a premium plan allowing greater uploads or higher memory.